PR extraordinaire Georgie Hobbs climbs aboard the podcast raft to discuss the turbulent relationship between the twin industries of journalism and publicity, in this extra-long, poorly-recorded, yet undeniably fascinating edition of the Ultra Culture podcast. Both armed with lists of our biggest professional gripes, we go head-to-head in a fierce competition to decide which is the marginally more irritating group: journalists or PRs. 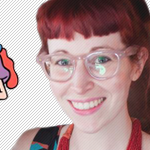 There’s also a look at two exciting forthcoming film releases and the promotional challenges they present, as well as an acknowledgement of Georgie’s resemblance to the popular late-90s toon idol Pepper Ann (pictured right).